The Graveyard Rabbit: Meet: Teresa Elliott, author of "Rutherford County, Tennessee Cemeteries"
Meet: Teresa Elliott, author of "Rutherford County, Tennessee Cemeteries"
I grew up in Antioch, TN. I had the advantage of being raised as an only child in a way, because my only brother had cerebral palsy and could not do the things that other brothers and sisters could do, like run and play games. But at the same time, my parents raised my youngest three aunts and uncles and numerous cousins lived with us as I was growing up, so I also had the advantage of being raised in a large household. I grew up on the family farm with aunts, uncles, grandparents as neighbors. It was the best of both worlds. I married my husband in 1985 and we moved to Alabama, where we still live with our three children. My ancestors are all from Rutherford County, TN, so that is where I do my research. I got interested in genealogy around 1989, when my great aunt asked me to help her find the father of my third great grandfather, George L. Gee. That man remains a mystery to me and her today. But it opened a world of opportunities to me. I became interested in photographing cemeteries soon thereafter, when I visited my first cemetery, the Bennett Cemetery in Rutherford County, TN looking for my ancestor, Stephin Bennett, whose body had been stolen and taken by train to Burlington, VT in a box marked books. Stephin's grave robbing was what got me totally hooked on genealogy. I photographed that cemetery and from then on, when I'd find a new ancestor, Dad and I would find the graveyard and I'd photograph the entire cemetery. 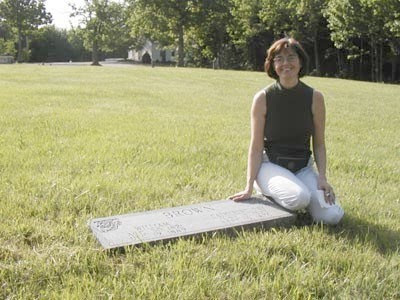 Since starting the blog, I have partnered with Patsy Paterson, who lives in Rutherford County, TN and she takes pictures and I put images online from people who send them to us of individual cemeteries. It's fun to watch the blogs grow and to read what people write to me about the cemeteries. I love using the blog format, because people can comment on a blog and that comment will stay with that cemetery. Before if someone sent me a comment, only I could read it. Now anyone can see the great genealogical information that is sent to me. With progress, something has to be lost, and Rutherford County, TN has seen great progress in the 1990s. With it, our old cemeteries have been lost or destroyed. Hopefully we can preserve them online, so that future generations can at least see what they looked like in 2009. It saddens me to be putting up a blog of a WWI soldier and his tombstone is already missing. This is a man who fought for his country less than 100 years ago, and already his memory is gone. His great grandchildren have no record of where he is buried. · Tennessee has snakes. Wear good protective shoes. Don't forget bug spray. · Take plenty of water. · Take a cell phone, but also take a buddy, because many rural areas don't have cell phone service. Also let someone at home know where you are going and when you plan on being back. · Take snacks, because it's sometimes a long way to the nearest convenience store. · Take plenty of batteries for your camera. · Always let the people at the nearest house know what you are doing. They tend to not release the hounds or shoot if they know why you are in the cemetery. · Take a first aid kit. · Try to take every stone in the cemetery, unless it puts you in danger. A great post and I love the cemetery advice! Thanks Thomas. It's fun to be a part of the Graveyard Rabbit family. Nice to meet you, Teresa. Grave robbing, fascinating. And great advice for cemetery searchers anywhere (although we have more bears than snakes here in British Columbia).